Open Mon-Sat 10.30am-4pm including Bank Holidays. Closed from 1.30pm Good Friday. Last entry to museum 3.30pm. Speranza return to the New Room for another lunchtime recital in our beautiful 18th Century chapel. Lunchtime recitals are free with a retiring collection. Speranza was founded in Moscow in 2007. 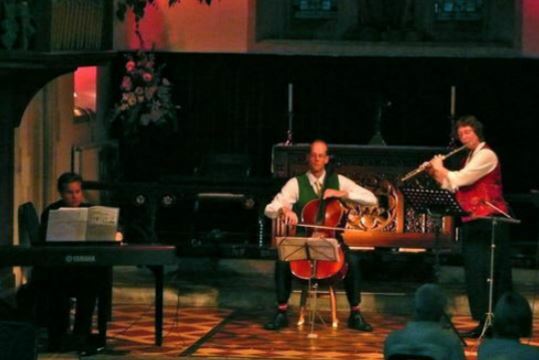 It developed from the work of the Christian charity Crescendo and was designed as a flexible chamber group performing in a wide variety of venues. It has since relocated to the UK and has performed a wide range of concerts featuring flute, cello, piano and other instruments. Kath Sugden BMus, PGCE, LTCL studied music at Cardiff University. Having taught for a number of years, she moved to Russia and set up Crescendo, working mostly with conservatoire students across Russia. There she studied with Valentina Daktyrova at the Gnesin Academy. She has performed in venues across Europe and is particularly interested in music from the 20th Century. Charles Sugden studied history at Cambridge though he was formerly a music scholar at Radley College. Having started as a flautist, he has since developed as a cellist, which he plays most often at Speranza concerts. As well as being a performing musician, Charles is also the chaplain of the Bournemouth Symphony Orchestra. Julian Williams started playing the piano at the age of 6 and the clarinet at the age of 10. He served in both the Somerset and the National Youth Orchestras as clarinetist. Julian studied music at Clare College, Cambridge, where he developed his gift of composition. Julian is rector at Nursling and Rownhams Churches. He is an avid cyclist and Francophile and has recently returned from a strenuous tour of the Massif Central. The New Room in Bristol is the oldest Methodist Chapel in the world (originally built in 1739) and the cradle of the early Methodist movement. The New Room is open Monday to Saturday 10.30am to 4pm all year round. Entry is free although donations are welcome. You can change your mind at any time, Click here to read how we handle your data.